The applicants who are willing to apply for Allahabad High Court Recruitment 2017 they should fill and submit the online application form in the précised manner on or before 7th January 2019. Entire information such as eligibility criteria, selection process, salary package, apply process, last date, etc. are mentioned on this page. Qualification Details: Aspirants should have attained 10th with Driving License / Bachelor Degree (Stenography / Computer Qualification) from a recognized Board / University / Institute. A non-refundable application fee of Rs. 750/- (Post 1,2), Rs. 500/-(Post 3) is needed to be paid by General / OBC Category Candidates. Contenders belonging to the SC / ST UP & interested & other Category : Rs. 500/- (Post 1,2), Rs. 300/- (Post 3). Candidates who are applying should be between 21 - 35 years (Post 1,2), 18 - 35 years (Post 3) as on 01-07-2018. The organization shall conduct the Written Exam, Shorthand &Computer Knowledge Test / Driver Trade Test for the assortment of the applicants. Candidates who are meeting with the above detailed eligibility parameters they may apply online for the application through the official website www.allahabadhighcourt.in on or before 7th January 2019. Online Registration Would Be Open From : 18-12-2018. Last Date of Online Application Is : 07-01-2019. The applicants who are willing to apply for SFIO Recruitment 2017 they should fill and submit the offline application form in the précised manner on or before Within 60 Days. Entire information such as eligibility criteria, selection process, salary package, apply process, last date, etc. are mentioned on this page. Candidates who are meeting with the above detailed eligibility parameters they may apply by downloading the application through the official website www.sfio.nic.in and send it to following address on or before Within 60 Days. Application Has To Be Sent Latest By : Within 60 Days. The applicants who are willing to apply for Kanchrapara Municipality Recruitment 2017 they should fill and submit the offline application form in the précised manner on or before 8th January 2019. Entire information such as eligibility criteria, selection process, salary package, apply process, last date, etc. are mentioned on this page. Qualification Details: Aspirants should have attained 8th / 10th / 12th / Graduation Degree from a recognized Board / University / Institute. A non-refundable application fee of Rs. 250/- (Post 1), 300/- (Post 2-9) is needed to be paid by General Category Candidates. Contenders belonging to the SC / ST / OBC Category : Rs. 100/-. Contenders belonging to the PWD (Persons with Disability) Category : Nil. Candidates who are applying should be between 18 to 40 Years (Post 1,2,5-9), 21 to 40 Years (Post 3,4) As on 01-12-2018. The organization shall conduct the Written Exam, Personality Test & Personal Interview for the assortment of the applicants. Candidates who are meeting with the above detailed eligibility parameters they may apply by downloading the application through the official website www.kanchraparamunicipality.org.in and send it to following address on or before 8th January 2019. Last Date to Submit Hard Copy of Application Form Is : 08-01-2019. Read Official Notification & Application Form Here 1. Read Official Notification & Application Form Here 2. The applicants who are willing to apply for HPSEB Recruitment 2017 they should fill and submit the offline application form in the précised manner on or before 27th January 2019. Entire information such as eligibility criteria, selection process, salary package, apply process, last date, etc. are mentioned on this page. A non-refundable application fee of Rs. 100/-is needed to be paid by Unreserved Category Candidates. Contenders belonging to the Reserved & Other Category : Rs. 50/-. Candidates who are applying should be between 18 to 30 Years As on 01-01-2019. Candidates who are meeting with the above detailed eligibility parameters they may apply by downloading the application through the official website www.hpseb.com and send it to following address on or before 27th January 2019. The applicants who are willing to apply for Baruipur Municipality Recruitment 2017 they should fill and submit the offline application form in the précised manner on or before 4th January 2019. Entire information such as eligibility criteria, selection process, salary package, apply process, last date, etc. are mentioned on this page. Qualification Details: Aspirants should have attained 8th / 10th / Diploma from a recognized Board / University / Institute. Candidates who are applying should be between 24 to 40 Years (Post 1), 18 to 40 Years (Post 2,3,5), 20 to 40 Years (Post 4). Candidates who are meeting with the above detailed eligibility parameters they may apply by downloading the application through the official website www.baruipurmunicipality.org.in and send it to following address on or before 4th January 2019. Application Has To Be Sent Latest By : 04-01-2019. The applicants who are willing to apply for District Court Belgavi Recruitment 2017 they should fill and submit the online application form in the précised manner on or before 21st January 2019. Entire information such as eligibility criteria, selection process, salary package, apply process, last date, etc. are mentioned on this page. Qualification Details: Aspirants should have attained 7th / 10th from a recognized Board / University / Institute. A non-refundable application fee of Rs. 250/- (Post 1), Rs. 200/- (Post 2), Rs. 150/- (Post 3), Rs. 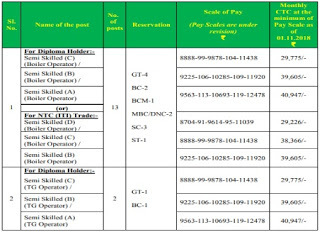 100/- (Post 4) is needed to be paid by General / OBC Category Candidates. Contenders belonging to the SC / ST / CAT-I / PWD (Persons with Disability) Category : Nil. Candidates who are applying should be between 18 to 35 Years As on 21-01-2019. The organization shall conduct the Tests / Viva-voce for the assortment of the applicants. Candidates who are meeting with the above detailed eligibility parameters they may apply online for the application through the official website www.districts.ecourts.gov.in on or before 21st January 2019. Starting Date of Online Submission of Application Form Is : 19-12-2018. Online Registration Ends On : 21-01-2019. The applicants who are willing to apply for CG Forest Recruitment 2017 they should fill and submit the online application form in the précised manner on or before 12th January 2019. Entire information such as eligibility criteria, selection process, salary package, apply process, last date, etc. are mentioned on this page. Candidates who are applying should be between 18 to 35 Years As on 01-01-2019. The organization shall conduct the Physical Test & Merit List for the assortment of the applicants. Candidates who are meeting with the above detailed eligibility parameters they may apply online for the application through the official website www.cgforest.com on or before 12th January 2019. Online Registration of Application Form Is Starts From : 01-01-2019. Last Date To Apply Online Is : 12-01-2019. The applicants who are willing to apply for CG Forest Recruitment 2017 they should fill and submit the offline application form in the précised manner on or before 21st January 2019. Entire information such as eligibility criteria, selection process, salary package, apply process, last date, etc. are mentioned on this page. Candidates who are applying should be between 18 to 35 Years As on 01-01-2018. The organization shall conduct the Written Exam & Physical Test for the assortment of the applicants. Candidates who are meeting with the above detailed eligibility parameters they may apply by downloading the application through the official website www.cgforest.com and send it to following address on or before 21st January 2019. End Date To Submit Hard Copy of Application Form Is : 21-01-2019. The applicants who are willing to apply for CG Forest Recruitment 2017 they should fill and submit the offline application form in the précised manner on or before 5th January 2019. Entire information such as eligibility criteria, selection process, salary package, apply process, last date, etc. are mentioned on this page. Candidates who are meeting with the above detailed eligibility parameters they may apply by downloading the application through the official website www.cgforest.com and send it to following address on or before 5th January 2019. Closing Date of Offline Submission of Applications Is : 05-01-2019. The applicants who are willing to apply for CG Forest Recruitment 2017 they should fill and submit the offline application form in the précised manner on or before 11th January 2019. Entire information such as eligibility criteria, selection process, salary package, apply process, last date, etc. are mentioned on this page. The organization shall conduct the Physical Test & Document Verification for the assortment of the applicants. Candidates who are meeting with the above detailed eligibility parameters they may apply by downloading the application through the official website www.cgforest.com and send it to following address on or before 11th January 2019. Closing Date for Forwarding Filled Application Forms : 11-01-2019. The applicants who are willing to apply for ICDS Recruitment 2017 they should fill and submit the offline application form in the précised manner on or before 10th January 2019. Entire information such as eligibility criteria, selection process, salary package, apply process, last date, etc. are mentioned on this page. Qualification Details: Aspirants should have attained Diploma / Graduation Degree / Post Graduation Degree / PG Diploma from a recognized Board / University / Institute. Candidates who are applying should be between 18 Years As on 01-01-2018. Candidates who are meeting with the above detailed eligibility parameters they may apply by downloading the application through the official website www.jkicds.com and send it to following address on or before 10th January 2019. Deputy Direct, ICDS, Kashmir, 2nd Floor, Block C Old Secretariat, Srinagar. Last Date for the Submission of Application : 10-01-2019. Read Official Notification Here 3. The applicants who are willing to apply for District Court Hassan Recruitment 2017 they should fill and submit the online application form in the précised manner on or before 19th January 2019. Entire information such as eligibility criteria, selection process, salary package, apply process, last date, etc. are mentioned on this page. Qualification Details: Aspirants should have attained 10th with Knowledge of Shorthand & Typing from a recognized Board / University / Institute. A non-refundable application fee of Rs. 200/-is needed to be paid by GM / CAT-IIA / IIB / IIIA / IIIB Category Candidates. Contenders belonging to the SC / ST / Cat-I / PWD (Persons with Disability) Category : Rs. 100/-. Candidates who are meeting with the above detailed eligibility parameters they may apply online for the application through the official website www.districts.ecourts.gov.in on or before 19th January 2019. Online Registration of Application Form Is Starts From : 20-12-2018. Last Date To Apply Online Is : 19-01-2019. The applicants who are willing to apply for District Court Hooghly Recruitment 2017 they should fill and submit the online application form in the précised manner on or before 29th January 2019. Entire information such as eligibility criteria, selection process, salary package, apply process, last date, etc. are mentioned on this page. Qualification Details: Aspirants should have attained 8th / 10th from a recognized Board / University / Institute. A non-refundable application fee of Rs. 300/- (Post 1,2), 250/- (Post 3,4) is needed to be paid by General / OBC Category Candidates. Contenders belonging to the SC / ST / PWD (Persons with Disability) Category : Rs. 250/- (Post 1,2), 200/- (Post 3,4). The organization shall conduct the Written Exam and Personality Test for the assortment of the applicants. Candidates who are meeting with the above detailed eligibility parameters they may apply online for the application through the official website www.hooghly.gov.in on or before 29th January 2019. Opening Date of Online Submission of Application Form Is : 28-12-2018. Online Registration Ends On : 29-01-2019. The applicants who are willing to apply for Zila Panchayat Bijapur Recruitment 2017 they should fill and submit the offline application form in the précised manner on or before 11th January 2019. Entire information such as eligibility criteria, selection process, salary package, apply process, last date, etc. are mentioned on this page. Qualification Details: Aspirants should have attained 5th / 12th / Diploma (DEO & Typing / Engineering) / Graduation Degree (So. Sci. / Mass Comm. / Rural Development) / B.Com / B.E / B.Tech Degree / Post Graduation Degree (Maths / Physics) / MBA / MCA / MCM / M.Sc (CS/IT) from a recognized Board / University / Institute. Candidates who are applying should be between 21 to 35 Years (Post 1-6), 25 to 35 Years (Post 7), 25 to 30 Years (Post 8) As on 01-01-2018. Candidates who are meeting with the above detailed eligibility parameters they may apply by downloading the application through the official website www.bijapur.gov.in and send it to following address on or before 11th January 2019. Last date to submit application form : 11-01-2019. The applicants who are willing to apply for Karnataka Bank Recruitment 2017 they should fill and submit the online application form in the précised manner on or before 2nd January 2019. Entire information such as eligibility criteria, selection process, salary package, apply process, last date, etc. are mentioned on this page. Qualification Details: Aspirants should have attained Graduation (Agricultural Sciences / Law) / Post Graduation Degree from a recognized Board / University / Institute. Contenders belonging to the SC / ST & Other Category : Rs. 500/-. Candidates who are applying should be between 21 to 28 Years As on 01-12-2018. The organization shall conduct the Online Exam / Personal Interview for the assortment of the applicants. Candidates who are meeting with the above detailed eligibility parameters they may apply online for the application through the official website www.karnatakabank.com on or before 2nd January 2019. Online Registration Starts From : 24-12-2018. 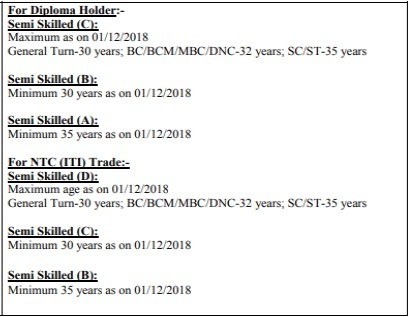 Dead Line For Apply Online : 02-01-2019. The applicants who are willing to apply for ISRO Recruitment 2017 they should fill and submit the online application form in the précised manner on or before 15th January 2019. Entire information such as eligibility criteria, selection process, salary package, apply process, last date, etc. are mentioned on this page. Qualification Details: Aspirants should have attained BE / B.Tech. Degree / Bachelor Degree (Architecture) from a recognized Board / University / Institute. Contenders belonging to the SC / ST / Ex-S / Women / PWD (Persons with Disability) Category : Nil. 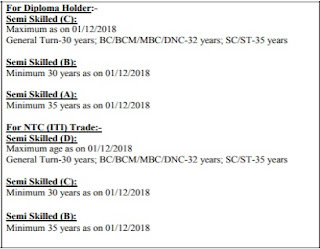 Contestant’s maximum age limits should be Below 35 Years As on 15-01-2019. Candidates who are meeting with the above detailed eligibility parameters they may apply online for the application through the official website www.isro.gov.in on or before 15th January 2019. Opening Date of Online Registration of Application Form Is : 26-12-2018. Last Date To Apply Online Is : 15-01-2019. The applicants who are willing to apply for SER Recruitment 2017 they should fill and submit the offline application form in the précised manner on or before 9th January 2019. Entire information such as eligibility criteria, selection process, salary package, apply process, last date, etc. are mentioned on this page. Contestant’s maximum age limits should be 42 Years As on 01-01-2019. The organization shall conduct the Written Exam & Typing Test, Document Verification for the assortment of the applicants. 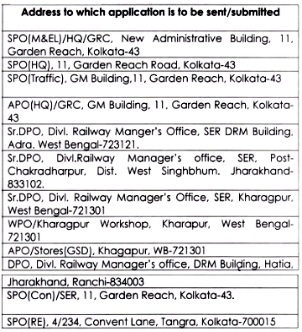 Candidates who are meeting with the above detailed eligibility parameters they may apply by downloading the application through the official website www.ser.indianrailways.gov.in and send it to following address on or before 9th January 2019. Last date to submit application form : 09-01-2019. The applicants who are willing to apply for Southern Railway Recruitment 2017 they should fill and submit the offline application form in the précised manner on or before 13th January 2019. Entire information such as eligibility criteria, selection process, salary package, apply process, last date, etc. are mentioned on this page. Contenders belonging to the SC / ST / Women / PWD (Persons with Disability) Category : Nil. Candidates who are applying should be between 15 to 22/24 Years. Candidates who are meeting with the above detailed eligibility parameters they may apply by downloading the application through the official website www.sr.indianrailways.gov.in and send it to following address on or before 13th January 2019. Last Date of Receipt of Applications : 13-01-2019. The applicants who are willing to apply for Western Railway Recruitment 2017 they should fill and submit the online application form in the précised manner on or before 9th January 2019. Entire information such as eligibility criteria, selection process, salary package, apply process, last date, etc. are mentioned on this page. Qualification Details: Aspirants should have attained 10th / ITI / NCVT / SCVT from a recognized Board / University / Institute. Candidates who are applying should be between 15 to 24 Years As on 09-01-2019. Candidates who are meeting with the above detailed eligibility parameters they may apply online for the application through the official website www.wr.indianrailways.gov.in on or before 9th January 2019. Opening Date of Online Registration of Application Form Is : 10-12-2018. Last Date of On-line registration : 09-01-2019. The applicants who are willing to apply for ECR Recruitment 2017 they should fill and submit the online application form in the précised manner on or before 10th January 2019. Entire information such as eligibility criteria, selection process, salary package, apply process, last date, etc. are mentioned on this page. Candidates who are applying should be between 15 to 24 Years As on 11-12-2018. The organization shall conduct the Merit List, Document verification and Medical Exam for the assortment of the applicants. Candidates who are meeting with the above detailed eligibility parameters they may apply online for the application through the official website www.ecr.indianrailways.gov.in on or before 10th January 2019. Online Registration of Application Form Is Starts From : 11-12-2018. Last Date For Applying Online Is : 10-01-2019. The applicants who are willing to apply for NWR Recruitment 2018 they should fill and submit the online application form in the précised manner on or before 30th December 2018. Entire information such as eligibility criteria, selection process, salary package, apply process, last date, etc. are mentioned on this page. Candidates who are applying should be between 15 to 24 Years As on 30-12-2018. The organization shall conduct the Medical Exam & Merit List for the assortment of the applicants. Candidates who are meeting with the above detailed eligibility parameters they may apply online for the application through the official website www.nwr.indianrailways.gov.in on or before 30th December 2018. Starting Date For Online Application Is : 30-11-2018. Dead Line of Online Application Is : 30-12-2018. The applicants who are willing to apply for UPSRLM Recruitment 2017 they should fill and submit the online application form in the précised manner on or before 8th January 2019. Entire information such as eligibility criteria, selection process, salary package, apply process, last date, etc. are mentioned on this page. Qualification Details: Aspirants should have attained BE / B.Tech (CS/ IT/)/ MCA / M.Sc(CS)/ MBA (Finance) /CA/ICWA/ Post Graduation Degree / Diploma from a recognized Board / University / Institute. Contestant’s maximum age limits should be Below 55 Years (Post 1,2), 40 Years (Post 3-15). The organization shall conduct the Written Exam, Group Discussion & Personal Interview for the assortment of the applicants. Candidates who are meeting with the above detailed eligibility parameters they may apply online for the application through the official website www.sids.co.in on or before 8th January 2019. Closing Date For Apply Online : 08-01-2019. The applicants who are willing to apply for Naihati Municipality Recruitment 2017 they should fill and submit the offline application form in the précised manner on or before 31st December 2018. Entire information such as eligibility criteria, selection process, salary package, apply process, last date, etc. are mentioned on this page. Qualification Details: Aspirants should have attained 8th / Certificate in Electric Workmanship / 10th / Junior basic trained from a recognized Board / University / Institute. Candidates who are applying should be between 18 to 40 Years As on 01-01-2019. Candidates who are meeting with the above detailed eligibility parameters they may apply by downloading the application through the official website www.naihatimunicipality.in and send it to following address on or before 31st December 2018. End Date To Submit Hard Copy of Application Form Is : 31-12-2018. The applicants who are willing to apply for VSSC Recruitment 2017 they should fill and submit the online application form in the précised manner on or before 11th January 2019. Entire information such as eligibility criteria, selection process, salary package, apply process, last date, etc. are mentioned on this page. Candidates who are applying should be between 18 to 35 Years (Post 1-14), 18 to 25 Years (Post 15,16). The organization shall conduct the Written Test, Skill Test & Physical Fitness / Endurance Test for the assortment of the applicants. Candidates who are meeting with the above detailed eligibility parameters they may apply online for the application through the official website www.vssc.gov.in on or before 11th January 2019. Starting Date of Online Submission of Application Form Is : 24-12-2018. Last Date of On-line registration : 11-01-2019. The applicants who are willing to apply for TNPL Recruitment 2017 they should fill and submit the offline application form in the précised manner on or before 4th January 2019. Entire information such as eligibility criteria, selection process, salary package, apply process, last date, etc. are mentioned on this page. Qualification Details: Aspirants should have attained 10th / ITI / Diploma (Engineering) from a recognized Board / University / Institute. Candidates who are meeting with the above detailed eligibility parameters they may apply by downloading the application through the official website www.tnpl.com and send it to following address on or before 4th January 2019. End Date To Submit Hard Copy of Application Form Is : 04-01-2019. 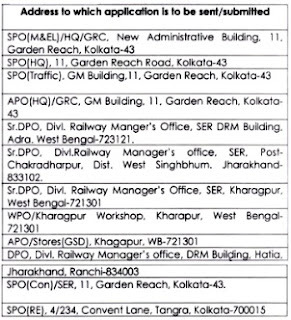 The applicants who are willing to apply for Kolkata Metro Rail Recruitment 2017 they should fill and submit the offline application form in the précised manner on or before 25th January 2019. Entire information such as eligibility criteria, selection process, salary package, apply process, last date, etc. are mentioned on this page. Contenders belonging to the SC / ST / Women / Minorities & Economically Category : Rs. 250/-. The organization shall conduct the Trial & Personal Intervie for the assortment of the applicants. Candidates who are meeting with the above detailed eligibility parameters they may apply by downloading the application through the official website www.mtp.indianrailways.gov.in and send it to following address on or before 25th January 2019. Last Date for Receiving Hard Copy of Application Form Is : 25-01-2019. The applicants who are willing to apply for Calcutta High Court Recruitment 2017 they should fill and submit the online application form in the précised manner on or before 19th January 2019. Entire information such as eligibility criteria, selection process, salary package, apply process, last date, etc. are mentioned on this page. Contenders belonging to the SC / ST of West Bengal Category : Rs. 200/-. The organization shall conduct the Preliminary Screening Test, Written Test & Viva-Voce Test for the assortment of the applicants. Candidates who are meeting with the above detailed eligibility parameters they may apply online for the application through the official website www.calcuttahighcourt.gov.in on or before 19th January 2019. Opening Date of Online Submission of Application Form Is : 20-12-2018. Online Application Will Be Received Till : 19-01-2019. Downloading of Admit Card Would Be Open From : 09-02-2019 to 24-02-2019. Written Exam Date : 24-02-2018.